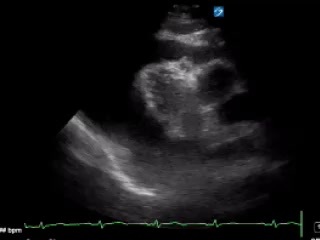 Parasternal Long axis (PLAX) of the left ventricle demonstrating a large circumferential pericardial effusion, (passes anterior to the descending thoracic aorta). 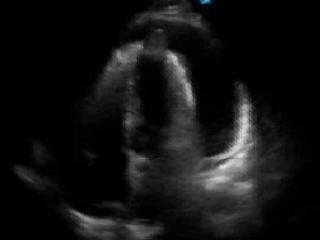 Note the RV anterior wall appears as though it may be collapsing in early diastole when RV pressure is at its lowest. Has the appearance of someone jumping on a trampoline. There is also a mid grey structure within the pericardial sac, attached at the junction of the RV & LV. The RV anterior wall is a common site for pericardial fat but in systole the mid grey structure appears to be more rounded. 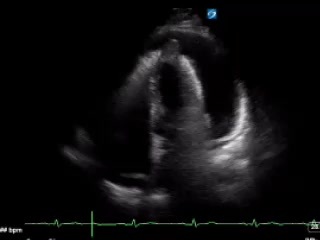 An M-mode through the PLAX view showing the pericardial effusion and more posterior structures demonstrates that the RV wall is moving towards the interventricular septum, (IVS) and LV during diastole (review in conjunction with the ECG). 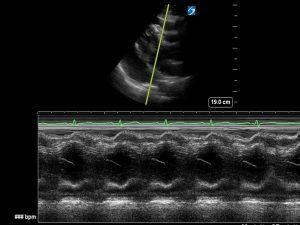 The RV anterior wall should be moving away from the IVS during diastole.This suggests cardiac tamponade but look in more views and integrate with haemodynamic status. 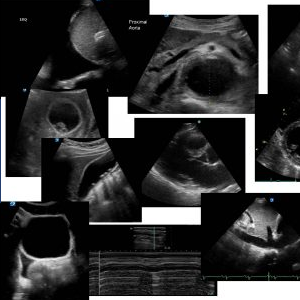 Apical 4-chamber view with a large circumferential pericardial effusion. There is involution of the RA wall again suggesting cardiac tamponade. There is a rounded structure in the pericardial sac attached to the apex of the LV . This structure proved to be a metastasis. The bright structure seen close to the left AV groove, visualised only during systole is another lesion. 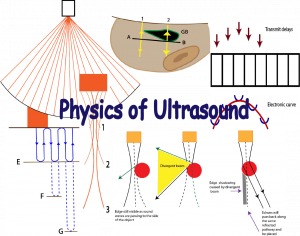 This entry was posted in Library, ECHO, Pericardial effusion. Bookmark the permalink.